Minneapolis, MN—November 10, 2015—Banner Engineering introduces the EZ-SCREEN® Light Screen (LS). This rugged, easy-to-use safety light screen is optimal for machine safeguarding and built to withstand challenging conditions found in manufacturing and packaging environments. 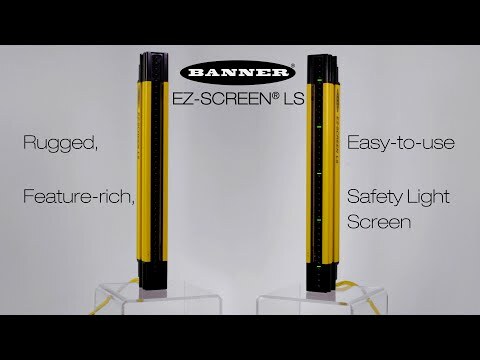 With a lean, simple design and enhanced performance features, Banner’s EZ-SCREEN LS provides a cost-efficient light screen safety solution. The EZ-SCREEN LS features highly visible and intuitive bi-color alignment indicators that allow for simplified setup, easy troubleshooting and streamlined installation. The end-to-end sensing design of the EZ-SCREEN LS eliminates gaps in detection when mounted on top of machine work surfaces and between cascaded segments. For added ease of use, the system requires no PC software, DIP switches or other device for configuration. To accommodate diverse applications, the EZ-SCREEN LS is available in three resolutions—14 mm, 23 mm and 40 mm—with a range of up to 12 meters. Sensor lengths range from 280 mm to 1,820 mm in 70 mm increments. Cascade models are also available, which allow users to combine up to four systems of any length, any resolution and any number of beams. Banner’s EZ-SCREEN LS features dual scan technology, which makes it highly immune to EMI, RFI, ambient light, weld flash and strobe light. The EZ-SCREEN LS is also compliant with the most rigorous world-wide safety standards, including FMEA testing to ensure control reliability, and is third-party certified to Type 4 per IEC 61496, Category 4 PLe per EN ISO 13849-1, and SIL3 per IEC 61508; SIL CL3 per IEC 62061. To withstand harsh manufacturing environments, the EZ-SCREEN LS emitters and receivers include a 5 mm recessed window and are protected against impact by a 3 mm thick aluminum IEC IP65/IP69 rated housing and metal end caps.